To say that I like Tyangra Maach is an understatement. It is a fish which stirs waves in my heart. Troughs and crests of love, passion, hope and some times disappointment. There was a time when its taut silvery body gleaming like a shiny rupee coin in the morning sun would send delicious shivers through my spine. Given a choice between taut, sinuous Farhan Akhtar and "Tyangra", I would have picked Tyangra even as a teenager on hormones. And that is saying a lot since that guy is one of my favorite Bollywood actors. 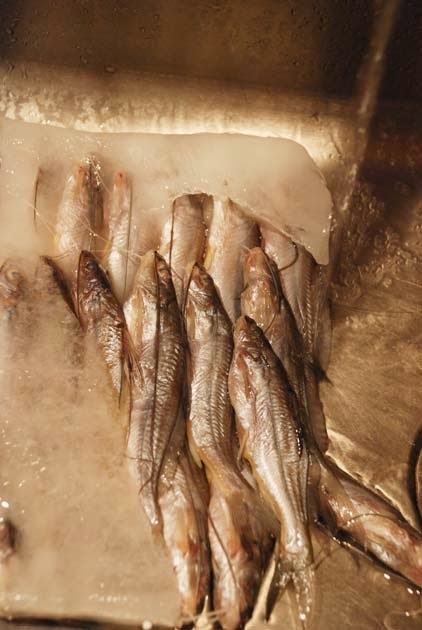 But frozen tangra in the US has mostly been disappointments, more so if the taste of the fresh fish is deeply ingrained in your brain. So we rarely buy the frozen Tyangra these days. In fact we rarely buy fish from the Bangladeshi store as the girls love salmon, the husband-man is not particularly interested and I am all for ease and comfort of baked salmon, tilapia and bassa. 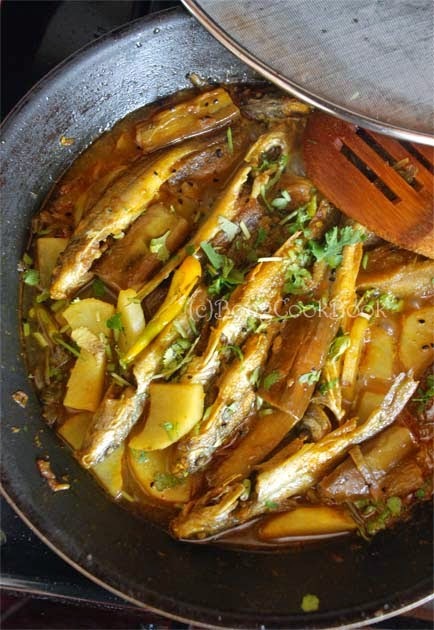 If the universe does not want me to remove scales -->fry fish-->then make a jhol, am I an idiot to to take that chore upon myself ? However things are different when family from India visits. Then we want the fish from the Bangladeshi store, cut in "bengali cut". 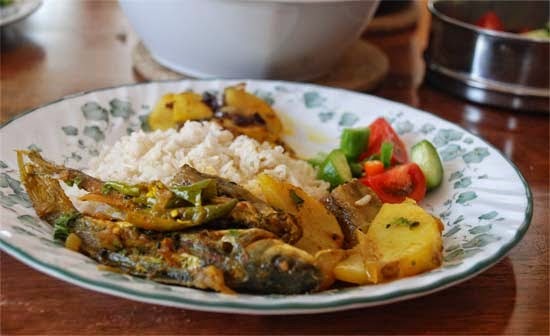 For a few days we revel in the pleasure of rui, pabda, ilish and tyangra. We promise ourselves that at least twice a month we will get our Bengali fish haul from the Bangladeshi store. We nod our heads in agreement that the Tyangra is pretty good even if a tad small and the Rui is actually better than what we have had in India. We renew our piscean vows in earnest. After all we are the "Fishy Bongs". 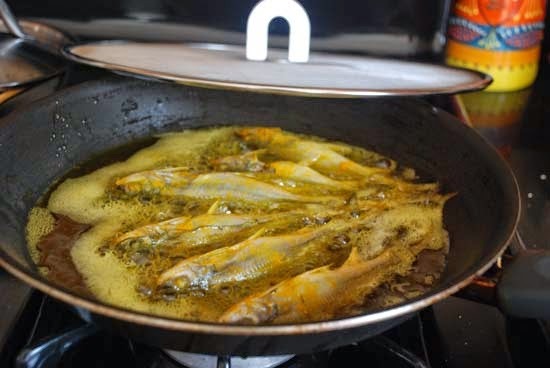 On those days, the kitchen fan is always set at high as we fry fish in Mustard Oil to be later put in different curries and the Jasmine scented Yankee candle works overtime to dispel the scent. Big Sis, moves around the house, her fingers pinched around her nose, careful that not a single note of fish scent should enter her system. Little Sis is excited about fish that has bones and eats rui and tyangra with much relish. She watches in amazement as I crunch down the fish head and lick with pleasure at the bones. "Would you even eat us Mommy when we were small?" she asks in trepidation and breaths relief that she is indeed too big for me to chew on her bones. "Dim(fish roe) ache or not?" And then, "Eki, maachh ta porishkar kora nei?" (Whaaat, has the fish not been gutted and cleaned?) followed with loud wails and hair tearing. Then we start imposing heavyweight blame on each other. "Didn't you even ask at the store if the fish was cleaned? Incorrigible"
"I didn't even want to buy Tangra. It was you who insisted. Always making wrong decisions"
As is clear, I was in total shock when after defrosting I realized that the Tyangra was neither gutted nor cleaned of its innards. I wanted to bawl my heart out, leave the fish right there in the sink and go read my Lila Majumdar. I needed serious consoling. However, as you might know(or not), I am a middle aged woman and though 21st century women's right dictates that middle aged women are not supposed to know home cooking, forget cleaning Tyangra, I felt a tad ashamed of my lack of fish cleaning abilities. The husband-man offered to clean the fish but again women's rights popped up in my head and I said "what a man can do a wo-man can do better". Honestly, any being, a smidgen more intelligent than me would have known that anything is better than cleaning that fish. Anyway words are like arrows, once you let them go, it is hard to retrieve or some such thing as Krishna had told Arjun. So acting all cool and confident, I checked around google a bit and asked Ushnishda (who should actually upload a video of the said fish cleaning some day). I also tried hard to recall what my Mother did when faced with fish like this. With all that knowledge I realized cleaning a fish like Tyangra is actually pre-t-t-y easy. Since this fish has no scales, you don't need to remove scales. But you need to gut the fish. Yeah, you heard me right and here is how you do it for small fish like Tyangra. 1. You take a kitchen scissor or a sharp knife and snip the fish around it is neck, at the base of the gills, making a narrow slit. ***Not as gory as it sounds***. 2.Then you prod the innards with your finger, spreading the cavity in the process and pull out the gills from the head region. You also pull out the entrails, a blackish looking string kind of thing from the stomach region. 3. Now rinse the fish inside out with water. It was okay and not difficult to do but given a choice I would rather get the fish cleaned than doing it again. With all that Tyangra, I made a spicy dish with potatoes and eggplants. I am not sure if you call it a Jhaal or a Charchari so I am calling it Tyangra Maachher Jhaal Chorchori. 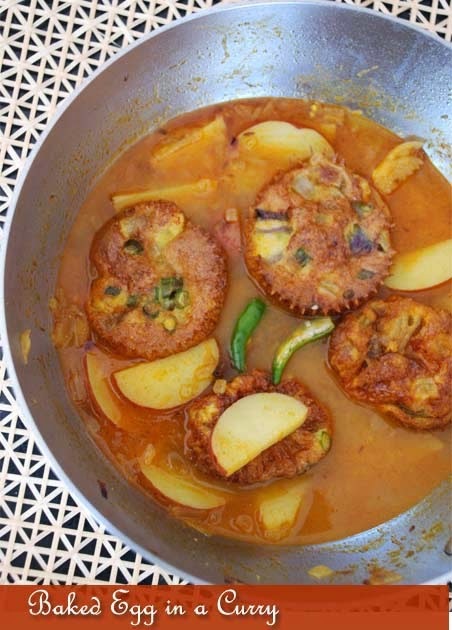 I did not add any mustard paste thought it is a jhaal but you can add a tsp of Kashundi along with the other spices. 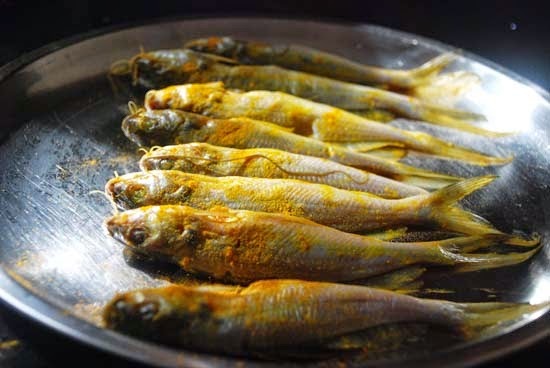 If the fish is very fresh, you should fry it only very lightly to make this dish. The recipe reads long only because I have broken up the recipe in parts. It is indeed a simple and quick everyday kind of dish. Well, my Mother's every day kind of dish. 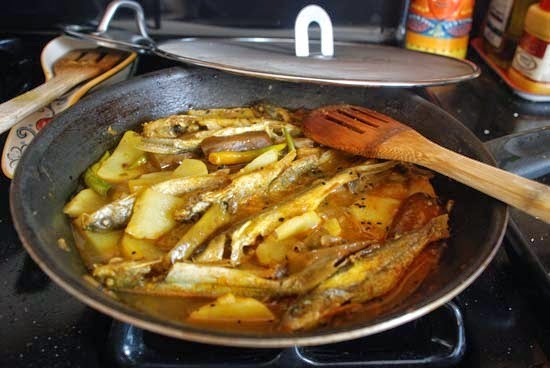 Once you get past the fish frying part, it is done fast and tastes great with rice. Chop 1 medium potato in half moon pieces. Heat enough oil for frying the fish. Mustard Oil is the best bet. I used a frying pan with a bigger surface area as I was going to fry several batches of fish. The oil should be smoking hot but not burning. Check by tossing a small piece of onion in the oil. It should rise up to the surface and sizzle. Sprinkle some turmeric powder on surface of the oil. I have a theory that this reduces the risk of oil splattering a bit. And I also have a splatter screen handy to save me from any hot oil playing truant. Ta-Da! Slide the fish gently into the hot oil. Do not drop them in like pakori batter. The fish should lie side by side on the pan and not heaped one over the other. Now keep the gas temperature at medium-high. Let the fish cook on one surface. Trying to flip it before it is cooked will cause it to break. After about 3-4 minutes, give a gentle nudge to see if it is cooked on the underside. Once the fish is easily flippable, flip and let the other side cook. 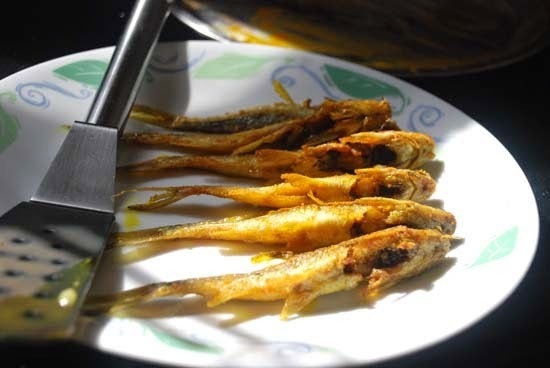 Please note that Tyangra should not be fried crispy so do not fry too much. Now all that oil for frying will not be needed in the dish. So save that oil for future use or get rid of it save the amount needed for the charchari. In the same frying pan, heat 2-3 tbsp Mustard oil(fresh or the fishy one). Next add the eggplant slices. Sprinkle some turmeric powder, little salt and saute the eggplants until their skin chars a little and the eggplant becomes a tad softer. They need not be fully cooked at this point. Remove the eggplant and keep aside. Saute the onion for 3-4 minutes until it softens. Onion will soften but not get crispy. Next add the potato slices, sprinkle some more turmeric powder and saute for 3-4 minutes. Cover the frying pan and let the potatoes cook. Intermittently remove cover and stir around the vegetables and sprinkle water if they tend to stick to the frying pan. Now add the fried fish and cook for a few more minutes until most of the water has evaporated. The dish will have little gravy. Add some chopped fresh coriander leaves and finish with few drops of mustard oil. Serve with rice. This post is about Posto Bhape but first we will not talk about Posto Bhape. Instead we will talk about Little Sis. If you can think of nothing but Posto then scroll down the page. Little Sis telling me about her Valentine's day project in school, " Mommy in our art class today, we made love." Since a lot of this conversation happens in the car, my hands on the wheel wavered. Big Sis gave her a look and said "LS, how can you make love in art class?" LS with an air of non-nonchalance " Oh very easy. You cut out L, O, V and E from pink neon paper and then spread glitter over it. Done"
Little Sis's class was learning about deserts in school. The Big Sis, trying to act smart because she is ten after all asked "Which Dessert ? The one you eat?" LS went into deep thought and then said, " Yes, you can eat there if you want. Deserts have some kind of cactus which we can eat"
I choked on my laughter as LS has a temper and gets very angry if I laugh at anything she says. She is very confused with "laughing at someone" and "laughing with someone". So if any natural action on her part ellicits laughter on our part, she doesn't like it. However when she makes goofy faces or a joke which I do not understand, I am supposed to break into peals of laughter or she gets mad again. LS has a friend in class called S. I have met her only briefly but from what I gather S is a spunky little girl. So LS comes home from school and calls me at work, to talk about S.
"Mommy, S is K and R's boss", she said with an air of finality, K and R being two spunky boys in her class. "Because they are in the same bus and also in the same class, she is their boss. And they have to do anything that she asks them to. HAVE TO." I was very impressed by this logic and also by the said S who has concocted this rule. So this little girl S apparently being the boss of K and R, did something which irked K and R and they wanted to complain to the teacher. S however forbade them to do so and this is what Little Sis explained to me, "If K and R complain to the teacher, then the teacher might tell her parents and S's Mommy and Daddy will think S is not a good girl. But S wants them and everyone else to think that she is a good girl so K and R should not complain about her." I was as amused by LS's logic as by S's antics.Go Bossy. LS knows the right moments to call me and get her things done. Every day around 2:30 in the afternoon, she calls and asks if she can have a cookie or a pack of fruit snacks. Now usually these are not part of her everyday snacks and so I ask her to have yogurt or some fruits instead. But she knows that I don't haggle much over the phone and she tries her best with pathetic calls every few minutes. Now to explain "Persuasive Writing" to BigSis, I was giving her LS's example and how she uses "pathos" to persuade me. BS thought for a minute and then said, "Not only "pathos" she also uses "threatos" a lot. She always threatens to cry if things are not her way." Now to this Bhapa posto which is my friend J's recipe. 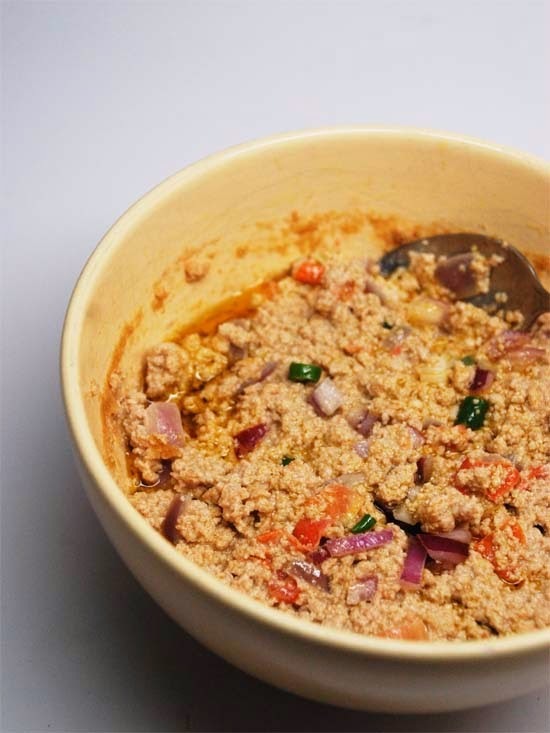 Among all the different dishes made with Posto, the very basic is Kaancha Posto bata or raw poppy seed paste where the wet poppy seed paste is mixed with raw onion, green chilli, salt and mustard oil and then had cold with rice. It is a solution to many of our Friday night dinners. 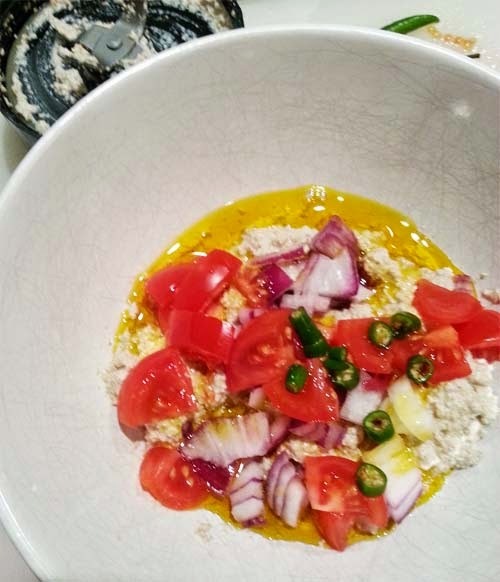 When J, who is an amazingly good cook suggested this one more step which would take all of 3-4 minutes beyond the raw and whip up posto in a new avtaar, we had to try it. And of course we have been hooked since and also buying a packet of posto every other week. 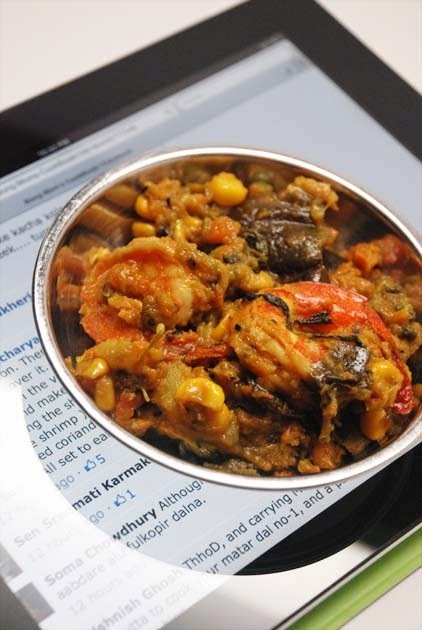 This Bhapa Posto (Steamed or baked Posto) was traditionally steamed in a small steam bowl along with the rice or later in a steel tiffin box placed inside the pressure cooker. Cooking it in the microwave is the most modern you can get. And yet the taste is the same. Clean, fresh, pure and of course delicious. Then make a smooth wet paste of the seeds -- posto bata-- in your wet grinder. I use my magic bullet for this purpose. While making the paste add splashes of water, only as little as necessary to aid in grinding. Alternately, you can also dry grind the posto in a dry spice grinder or coffee grinder. Mix the dry ground posto with water to make a thick wet paste. 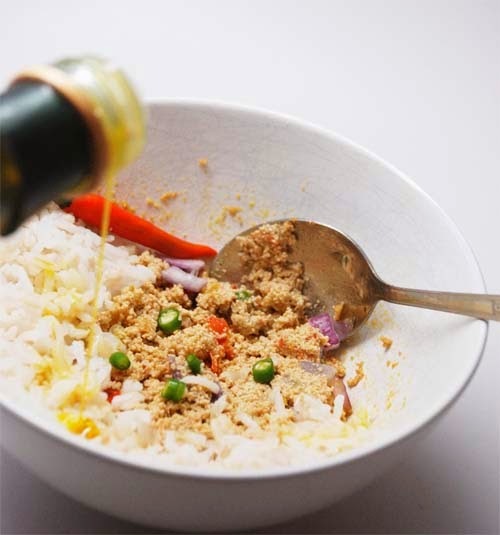 Take the wet poppy seed paste in a bowl. Add more Mustard Oil. VERY VERRY IMPORTANT. Baked Omlette is an oxymoron. Or so I thought. But apparently not so. Google has solved my problem. Still "Baked Omelette er jhol" is like "shonar pathorbati" or a "gold stone bowl" and our little Miss Perfect aka BigSis noticed that out and out. "This", she said, pointing at the all-clad stainless steel saucier plonked at the middle of the little round table in the kitchen. He fingers pointed at the gravy -- thin and runny, with half-moon slices of potatoes floating around lazily and strange UFO shaped structures nestled in between. "This is not Omelette er Jhol", she said, her eyes squinted, her face honest. I snapped at her. "Decide the name of the dish when you cook your own," I said. She kept quiet and ate her lunch. "But it is good," she said. 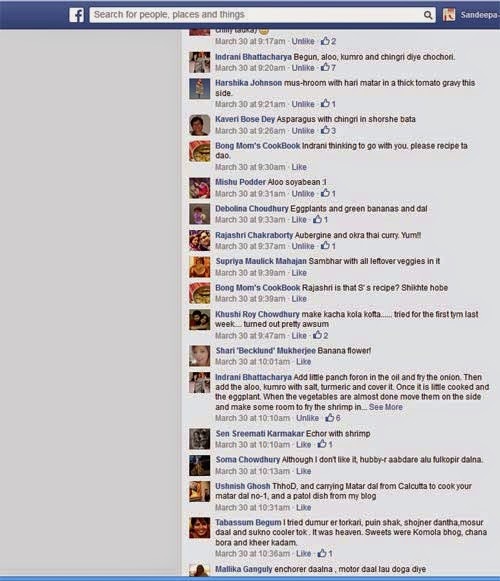 "Not as good as the fried omlette er jhol," I sighed. 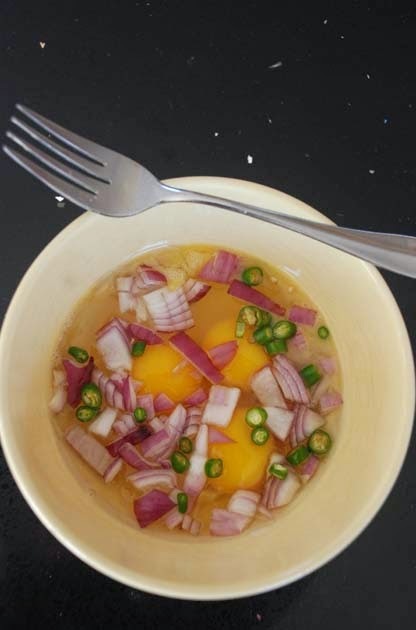 Omelette er jhol or Indian style Omlettes in a gravy, is one of my favorite egg dishes. There is something about an omelette basking in a thin curry and growing fat and pillowy, all so that you can bite into its softness and let the curry juice trickle down your throat. It makes an omlette far more sensuous than an omlette. But then of course I cannot let sleeping dogs lie or fried omelettes fry. So this time around, I baked them. And I did it in cup cake molds. Just like I make these egg muffins. You can of course bake them in a baking dish or even steam them in a cooker like I do for this Dim er Dhoka. Or you can simply fry an omelette. At the end all of them gets dunked into the jhol. Kind of like us. No matter what and how we are born, at the end we are all dunked in the jhol of life. Thanks for all your suggestions in the last post, it helped a lot. I will be back soon, with some vacation pics and announce the winners. Until then enjoy your own Omelette er Jhol. First take 3-4 large eggs. Or more eggs if you so wish. Let us not even go into the conundrum of which comes first "Chicken or the Egg"
Now comes the difficult part. Break the eggs in a bowl. Now with this egg you can do any ONE of the following three. A flowchart would have helped but what the heck. 2. Pre-heat Oven to 350F. Pour this egg mix in a greased oven safe bowl because it needs to be baked. 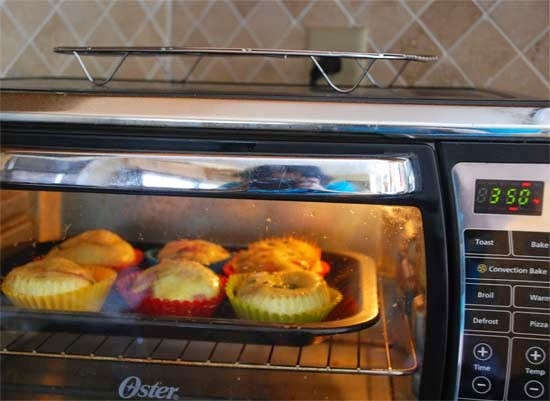 The size of the baking dish is important and make sure that the batter does not form too thin a layer. I think a 8" x 8" baking dish would be good for this many eggs. Bake for 30-35 mins until the crust starts turning golden. Take out of the oven and carefully cut in large cubes. 3. 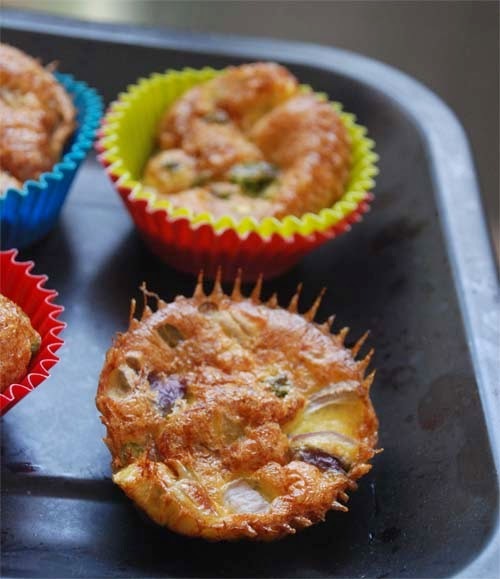 Pour out the batter in greased cup cake holders. I had six silicone cup cake liners and I used them. Bake for 30-35 mins until the crust starts turning golden. Making the thin gravy for Omlette er Jhol. You can make a richer and thicker gravy if you so wish. Toss in 1 potato cut in thin half moon shapes. With a sprinkle of turmeric powder, saute the potatoes until they turn golden. Next add a chopped tomato. But since I did not have any tomatoes at hand, I added 2 tbsp of tomato ketchup. Now add about 1/2 tsp of ginger paste. Saute for a couple of minutes. Add this masala paste to the potatoes in the kadhai and cook at low heat for 2-3 minutes. Once the jhol/gravy is ready add the baked pieces of egg or the omelette into the gravy and let it simmer for 3-4 minutes. Serve hot with rice. If you let the egg soak in the gravy for a longer time, it will soak up all the liquid like a sponge so be careful. The Bengali New Year, Poila Boishakh--the first day of the month of Boishakh is around the corner. Thankfully signs of spring have started showing up in my corner of the world too. 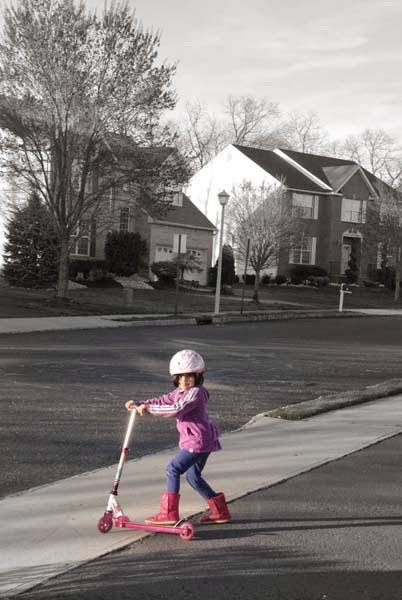 Looks like Winter has finally taken a break and gone to vacation land. 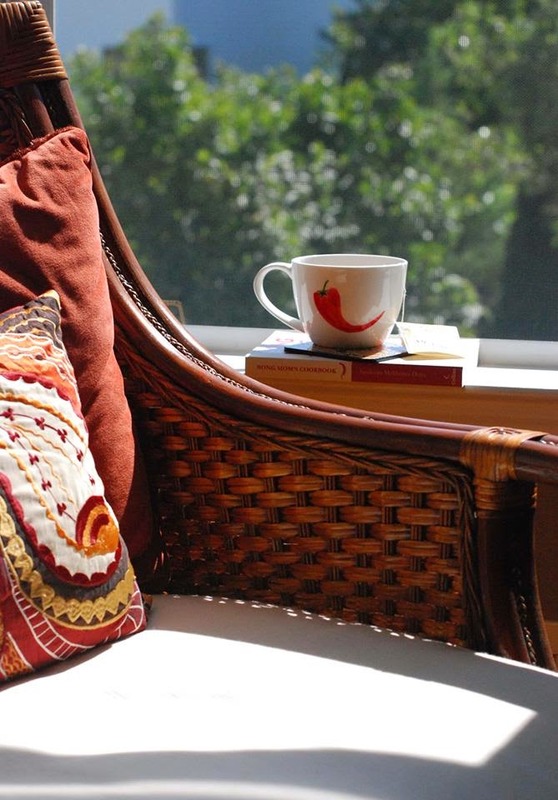 To celebrate the New Year and to thank all readers of Bong Mom's Cookbook I am sharing with you my love for tea and tea/coffee mugs. My talented blog friend "Rhea Mitra-Dalal" who blogs at euphoRHEA makes these amazing hand painted mugs and plates and all kinds of hand painted crockeries. She made these lovely tea cups for me and then I asked her if she could please make a few more for you guys too. Aren't they really pretty ? See, why I wanted to share them with you ? To win a cup all you have to do is tell me "What would you like to see in my blog in the future?". Leave your comment with your contact e-mail and the country where you are from. 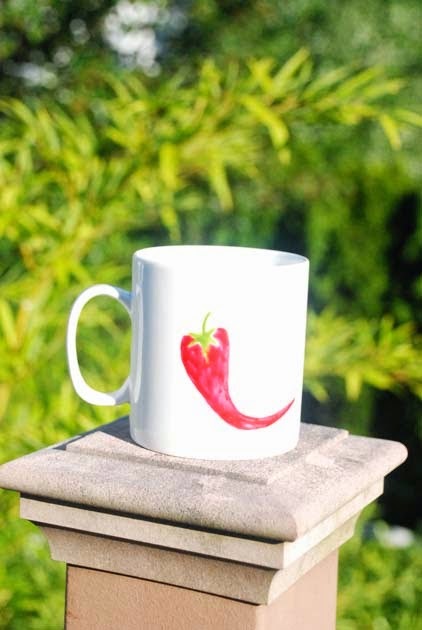 Readers from India have a special advantage this time as the winner gets this cup and one other item of their choice from euphoRHEA. Note: Due to shipping restrictions etc. this giveaway is restricted to India and US only. I have been in a vegetable rut for the last one week and I have realized that no one makes simple, subtle vegetable dishes as well as the Bongs do. Call me biased but honestly the variety of vegetable dishes that a Bengali will cook is mind boggling. 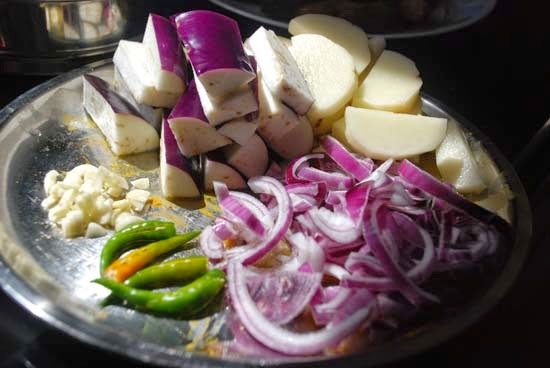 Remember, I am not saying vegetarian dishes, because no Bong can beat the masala dosa or the dhokla, but I am saying "vegetable dishes" as in preparations which have vegetables beyond potatoes and cauliflower in them. Not that those aren't vegetables but you get my point. 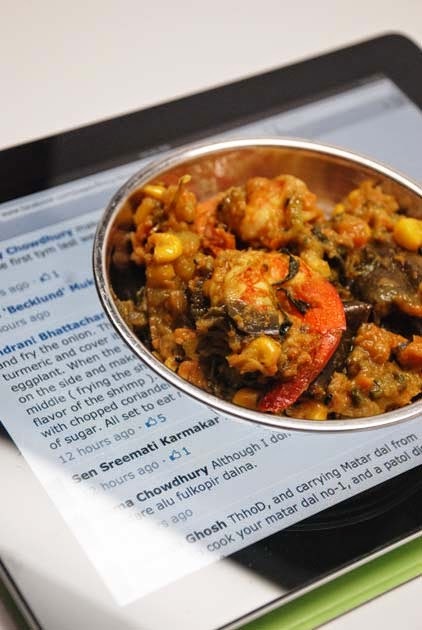 Why, those vegetable dishes might even have shrimp in them. I do believe that a person's association with food is deeply rooted in his genes. We have a natural fondness towards the food our fore fathers ate. Gradually we branch out and diversify from that core cuisine and yet we never go so far as to lose our anchoring the core. We are ready to be reeled in like a kite flying high and wide in the right moment. And it is not only an emotional attachment but the body too seeks the comfort of the familiar. Take me for example. I love a mean pasta, a hearty coconut-y Thai curry, a kadhi-chawal and yet after 2 weeks of eating straight through any of those, my body protests and looks around for aloo-posto. In those times, it never ever craves for a pulled pork sandwich or a creamy macaroni cheese. This realization donned on me only recently, when after a week of eating dal, garlicky sarson saag, spice coated chole and aloo-gobi, my soul and body craved for some subtle vegetable dish. Something light, with no over powering smell of musky cumin, earthy coriander or any other masala. A simple tempering of PaanchPhoron or Kalonji and some green chillies is all it wanted. As much as I loved the chhole, my body protested, veering me around, pushing me towards what my Bengali grandmother ate. I am thinking, this phenomenon has also something to do with age because a younger me would have waded through months of noodles and dosa without a worry. I was out of idea, as to what vegetable to cook and hence eat. So, I asked on my FB Page and many many excellent suggestions tumbled in. Of all of those, on that particular day, Indrani Bhattacharya's "Begun Kumro Chingri" inspired me. It was just the kind of thing, my body wanted and of course the soul always wants some chingri/shrimp. Always. So I went out to get some Kumro(Pumpkin) and also got some methi greens which looked dusty and bored but fresh sitting on the grocery aisle. And then I had to get some Uchhe aka bittergourd as those are my daughters' favorite veggies. Back home, I decided to add the fresh methi and uchhe to this charchari too, kind of like a one pot vegetable dish that you cannot get enough of. Because though there are vegetables is this dish, there is also chingri aka shrimp in there. Didn't I tell you, no one treats vegetables better than a Bong does. The shrimp made it a favorite for the 10 year old Big Sis who is inching towards becoming a vegetarian these days. LS will not eat a shrimp but she too loved this dish with white rice. "I am a mother of two girls (7 and 3 years). I love to eat and try out different types of food. I didn't know anything about cooking until I got married. Now I enjoy and love cooking. For the last 3 years I am not working and enjoying my time with the kids. My husband inspires me the most for cooking. He always appreciate my effort." Thank you Indrani for sharing your recipe with us. Don't forget to check the new post on the kids' blog about a simple experiment to understand Newton's third law. Chop 1 eggplant in cubes. Soak in salt water for 15 minutes. 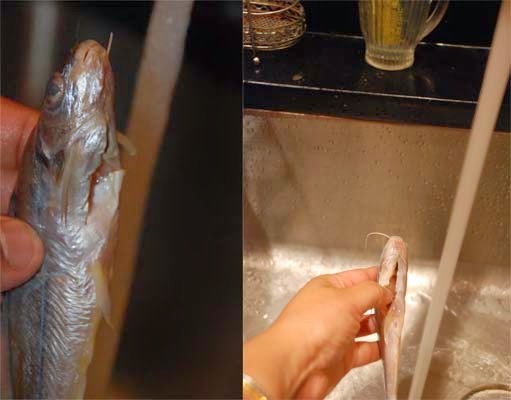 If using fresh shrimp de-vein and clean them. Then toss them with turmeric powder and salt. If using frozen shrimp just defrost and toss in turmeric powder and salt. Heat Oil in a Kadhai. Mustard Oil is best but I also use Olive oil if there is no fastidious foodie around. Add the cubed eggplants and saute them with turmeric powder until the eggplant softens a little. It will not be fully cooked yet. At this point, remove sauteed eggplant cubes and keep aside. Add little more oil to the same kadhai and heat. Temper the hot Oil with 1/2 tsp of Kalonji/Kalo jeere and about 4-5 green chillies. Note: Another option is to use paanchphoron for tempering as Indrani does in the original recipe. When the spices pop add the chopped bittergourd. With a sprinkle of turmeric powder, saute bittergourd for 3-4 minutes. Next add the pumpkin and carrots(if using). Saute for a few minutes and then cover the kadhai. Occasionally remove cover and give the veggies a stir. When pumpkin has softened, add the eggplant and toss all vegetables together. Now push the veggies to the side and add the methi leaves. Saute the methi leaves along with the other vegetables for a couple of minutes. Now cover the kadhai and let all vegetables cook. You won't need to add any water as the softer veggies will provide enough moisture to cook. Once veggies are all done and have kind of lost their individual identity, taste the dish. Add salt or sugar as needed. Now move the vegetables towards the edge of the Kadhai and add a little more oil at the center. You will have to do this only if you have started with less oil in the first place. When the oil has heated up, will only take a minute, add the shrimp. Saute the shrimp until it loses its raw color. Toss the shrimp with other vegetables. And there your vegetable dish is done. Done. And ready to be devoured with some dal and rice.